School may be out for the summer, but for district leaders, the work continues. Many superintendents, assistant superintendents, and business managers will spend the summer break planning for future enrollment growth, or developing strategies to deal with the current effects of unplanned growth. For many districts, a boundary review will prove to be the right solution to balance school capacities and student enrollment. There are different ways to update school boundaries, but not all of them allow for a smooth process and successful outcome. To help school districts update boundaries as efficiently and effectively as possible, we’re launching a series of three posts on how to redraw boundaries using the consensus-based and data-driven approach that has led 100% of our school district clients to successfully update boundaries that satisfy the needs of both the community and the district. Today, we’re showcasing the first step in the process: student enrollment forecasting. Read on to learn how our geographic approach goes beyond district-wide forecasts to provide more accurate and detailed information about projected student enrollment. Demographers have long provided enrollment forecasts to school districts, but these forecasts are traditionally district-wide and not broken down for individual schools—where it matters most. So, while district leaders might know how many fourth graders to expect for the district in total over the next five years, they won’t know what the enrollment forecast is for individual schools. That could result in unbalanced enrollment—unexpected overflowing classrooms in some schools, and empty desks in others. That’s where our geographic approach comes in. We match enrollment trends with projections for where residential growth will likely occur, and for the expected movement of people in and out of neighborhoods, to accurately anticipate where in your district student enrollment is likely to change. Once a district has a detailed student enrollment forecast, administrators can easily see which schools are likely to be over or under capacity in the future—information crucial to ensuring that new boundaries will meet the future needs of the district. The next important step in the boundary review process is hearing what the community has to say about the potential impacts of new school boundaries, so stay tuned for our second post on community consensus building. 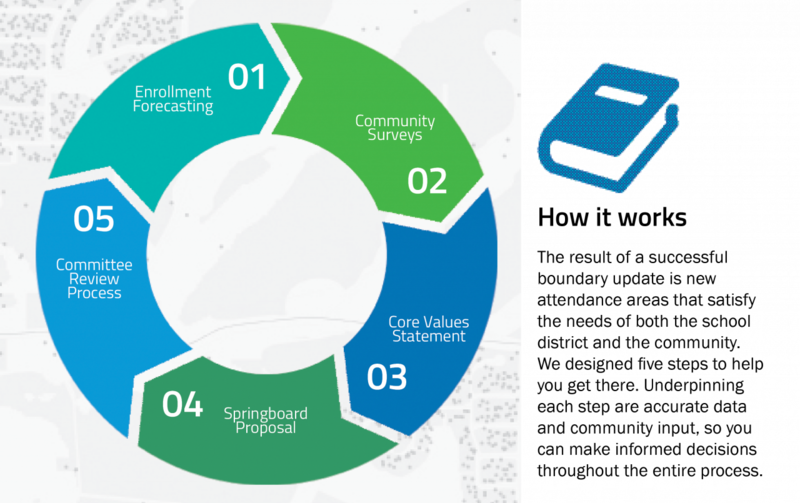 Questions about our geographic approach to student enrollment forecasting and school boundary reviews? Click here to get in touch, or download our boundary updates brochure to learn more.